Chewing gum was not a ‘respectable’ thing to do in India in the 1970s or 1980s. It was something that only good-for-nothing teens and Bollywood baddies did. 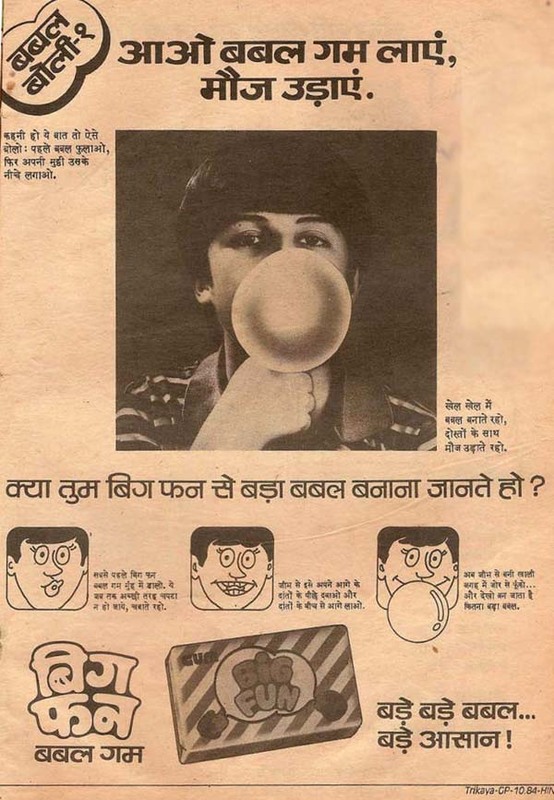 Then, India’s first bubble gum brand Big Fun changed the game – they introduced the concept of not just chewing gum, but blowing them into bubbles. During the 1980s, when hard candies and toffees were all the rage, Big Fun was about making bigger and bigger bubbles. In its print advertisement, Big Fun even taught children how to blow the gum in three simple steps. “Bade bade bubble, bade aasan,” the ad read. Some children practiced it like an art form. “Big Fun was not as soft as chewing gums are today. It was rectangular in shape, pink in the colour, with an extra sweet taste. It was very hard in the first bite and we used to chew it a lot before making the first bubble,” Kajal Jaitley, a 32-year-old Delhi-based homemaker recalled. But it wasn’t the big bubble that was Big Fun’s claim to fame. Gum India Limited, the manufacturer of Big Fun, started attracting children by printing Disney characters on the back of wrappers. The promotional strategy really took off when the 1987 cricket World Cup was around the corner. Big Fun started giving free collectable cards with cricketers on them. The sports cards became an instant rage and still produces nostalgia in many who grew up in that decade. It was, after all, an era when every child had a collection – stamps, coins, postcards from pen pals, match-box covers, bottle caps and so on. Big Fun became synonymous with the cricket cards. The cards had details of the cricketers, runs scored, wickets taken, etc. “We used to collect the cards and keep it safe so that we could brag about the collection. There was also a scheme to collect a set of cards and exchange it with comics based on the scores,” recalled Jaitley. The card with Kapil Dev’s details and picture was a favourite among children, along with Ravi Shastri, Mohammad Azharuddin and Viv Richards. “Big Fun was one of the pioneers in the chewing gum market during the ‘80s in India. Launched in 1985, this brand focused on some very innovative sales promotions to make its mark. Its promotional campaign to give away cricketers cards became a marketing case study,” said advertising veteran and CEO of Tempus, Sai Nagesh. Big Fun reached out to sportsmen through celebrity management firms to offer more and more cricketing cards to its customers. For instance: Chennai-based advertising and public relations company, TNQ Sponsorship, got four popular sports stars for the company in the ‘90s, according to its website. “We obtained for Gum India Limited, endorsements for their Big Fun Bubble Gum brand from cricketers, Ajay Jadeja, Javagal Srinath and Nayan Mongia for 1996-97. In its second year, the program featured Ajay Jadeja, Nayan Mongia, and Robin Singh,” says its website. However, in 1994, deep-pocketed multinational Perfetti Van Melle launched Centre Fresh and Big Babool, which were better in terms of quality and packaging. The television ads were also more exciting. It came in a variety of flavours such as strawberry, watermelon and mint. Big Babool started offering freebies in the form of permanent tattoos as well. 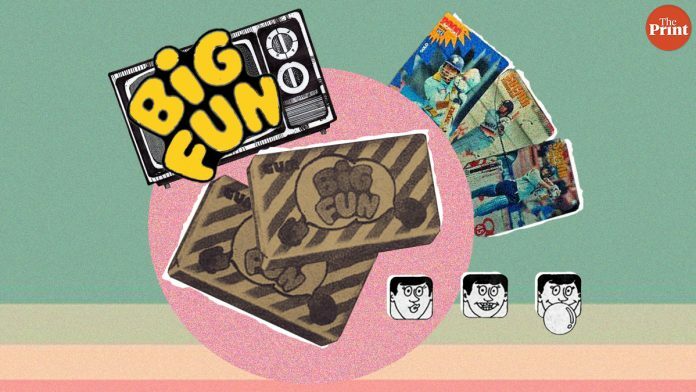 Despite Big Fun’s phenomenal promotional strategy, by the early ‘90s, the brand started disappearing from the market. “While the exact reasons are not known, I suspect that the product formulation – as it was very hard to chew – combined with the financial drain due to the mega promotions led to the gradual demise of this innovative promotions-led brand. The company was liquidated and no information is available about it,” said Nagesh adding that the power of a good campaign is that “it remains in the memory of an entire generation, forever”. “The story of all brands before the ‘90s is almost the same. Like others, Big Fun also couldn’t stand the competition from rich international players. Wrigley’s and Perfetti were the world leaders in chewing gum and they knew how to play the game right. Despite the right marketing strategy, the product quality couldn’t match the international brands,” said Ankur Bisen, senior vice-president at retail consultancy Technopak. However, the brand has a strong recall value — not because of the flavours, but because of the collectables — and it keeps finding mention in several blogs and stories. “Collecting 300 Runs and 30 Wickets would get you a calendar with cricketers photo and autograph,” wrote Ashish in his blog titled “Childhood Memories”. The brand also found mention among cricket anecdotes. “Back then cigarette brands such as Wills and Benson & Hedges were still allowed to sponsor tournaments, sweetened aerated drinks were not even close to taking over the cricket market, and kids in India chewed Big Fun bubblegum. It didn’t promise you bright teeth or fresh breath. You had toothpaste for that. In fact, Big Fun didn’t even run advertisements, but any kid would gladly spend on Big Fun, even if it was the last half rupee he ever got,” wrote Sidharth Monga, Assistant Editor at ESPN Cricinfo in an article. Some of the freebie cricket cards are still put up for sale from time to time by enthusiasts on different forums. The draw of nostalgia is always strong.